Dr. Srinubabu Gedela is a serieal entrepreneur and the recipient of “Young Scientist” award from the prestigious Human Proteome Organization at Seoul, Korea in 2007 for his pioneering research in the study on early stage identification of Diabetes. He received his Ph.D from Andhra University in 2007 at the age of 25 and has a Post Doctoral experience from Stanford University. He is also the recipient of Best Young Entrepreneur in 2015 and 2017 and Unique Global Leader Award 2017. The group companiesOmics & Pulsus group employ more than 5,000 employees with 75% of them being womenThey work out of six SEZ units at Hyderabad, Chennai and Delhi. Going forward,PULSUS is establishing its own IT/ITeS Campuses, Life Sciences Skill Development Campus,scientific and healthcare information translation centers at Hyderabad,Visakhapatnam andNoida. 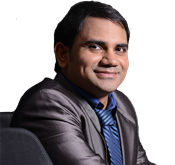 Dr. Srinubabu started his entrepreneurial journey in 2009 by founding Omics International Pvt. Ltd, with a profound vision of making scientific literature accessible to everyone on the globe free of cost, an idea which has actually borne out of the hardships he has faced while doing his Ph.D, and how the researchers from developing countries are shortchanged with the access to the extant scientific literature from around the world which has been controlled by global publishers with an iron-fist. What started as one single open access journal in 2009, the group today has grown to 1000 scientific and healthcare journals in the fields of Clinical, Medical, Engineering & Technology,Management, and Life Sciences that publishes over 50,000 scientific research articles annually. Dr Srinubabu Gedela used to travel from Visakhapatnam to Hyderabad (700 kilometers) once in a month or once in two months to get relevant litarature for his research during his doctoral studies. Dr Gedela expressed his concern on under developed/developing countries scholars are not able to access scientific literature during his Young Scientists Award ceremony at South Korea in 2007. He told toHuman Proteome Organization (HUPO) committee, subscription based journals cost is very high, to access each article is costing about $50-57dollars. Developing countries scholars may not spend this amount to access literature. With the support from members of HUPO, he started his first open access journal called "journal of proteomics and bioinformatics". Most of the editorial board members are HUPO organizing committee members. After that Dr Gedela moved to Stanford University for his postdoctoral, with the support from Stanford University Alumni the journals were increased. The open access journals content also reaching thousends of scientists across the world, Open access journals got it's momentum and reader base also increased to millions. Omics quickly expanded its activates to International Conferences and Events. With more than 3000 Global Annual Medical and Scientific Meetings in 40 countries, the group annual meetings are dais for 200,000+ scientists for meaningful interaction and discussions where world class scientists, and business professionals deliberate their knowledge with young and aspiring scholars. As part of their spectacular growth during the last 9 years, Omics acquired several small and medium size companies in publishing and events sectors, mainly from Europe, Canada, USA and Russia. In 2016 Dr. Srinubabu acquired PULSUS Group, a highly reputed 30-year-old Canadian health informatics, medical and scientific publisher. Omics & Pulsus group employ more than 5,000 employees with 75% of them being women. They work out of six SEZ units at Hyderabad, Chennai and Delhi. Going forward, PULSUS is establishing its own IT/ITeS Campuses, Life Sciences Skill Development Campus,scientific and healthcare information translation centers at Hyderabad, Visakhapatnam and Noida . Furthering his service to the society, Dr. Srinubabu is now embarking on translating the Global Scientific Literature from English to other foreign languagesJapanese,Russian, Chinese, Germanetc. and also into Indian languages Hindi, Telugu, Guajarati, Tamil, Begali etc. Once this is completed INDIA will become global hub for knowledge and everyone in the world will have access to the rich source of Healthcare information in their local languages. Removing language barriers in research. Making healthcare and scientific information accessable to remotest corners of the world in theirpreferred language for free of cost. To fulfill this objective Dr Gedela group is initially establishing healthcare and agriculture information translation center in Greater Noida with the support from Goverment of Uttar Pradesh.As per reports of KPMG/Google 550 Millions (55 crores) people of India uses local languages to search/browse internet (By the year 2020-21). The above traslated information will be useful to millions of Indians especially farmers to update thier knowledge in new agricultural developments incombination of raising field crops, orchards, vineyards, poultry, or other livestock in thier preferred languages. Rural and Urban Indians gets free healthcare knowelge in thier preferred language for free of cost. Knowledge is power, Rural indians can increase thier healthcare conditions by taking necessary precaustions. Indian Regional language apps all the rage, to have 550 million users in next 3 years. Language tools empowerment to create content in regional language. Local language industry will combine online and offline potential which has the space of worth over $10 billion. The digital ad spends alone will be worth $1.5 billion by 2020. - Online traffic will catch the attention of advertisement industry. -Customized content, Membership services for regional language consumers. The growth of digital content, is driving the growth of the creative sectors. Skill Development Centre is an initiative to empower the youth of the country with skill sets which make them more employable and more productive in their work environment. India is a country today with 65% of its youth in the working age group. If ever there is a way to reap this demographic advantage, it has to be through skill development of the youth so that they add not only to their personal growth, but to the country’s economic growth as well. Most of the Life Sciences and Pharma gradutes are comingout from thier Universitities/Collgeges with out much exposure on practical knowledge. To fulfil thier skill development gap on advaced instrumenation hadling the group is establishing Pulsus Life Science and Pharmaceutical Sciences Skill developments centers in India. Pulsus &Omics International Pvt Ltd and Its associate companies conducting scientific, agriculture and healthcare conferences in 40 countries and operating from six Special Economic Zone(SEZ) Units with 5000+ Employees. Young Scientist Award from HUPO at Seoul, South Korea in 09 October 2007.